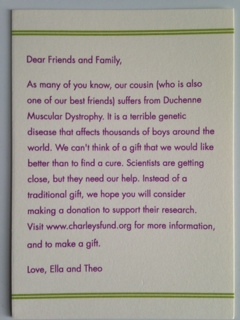 If you’re following Charley’s story, by now you’ve probably heard of Theo and Ella. These two are Charley’s first cousins, but they’re really more like soul mates or at least siblings. Between the curly hair, the wacky sense of humor and the amount of time he spends with the Dassins, Charley could easily be (and often is) mistaken for a triplet. Despite the incredibly close family bond, it still blew us away when Theo and Ella voluntarily and willingly and happily requested donations in lieu of gifts in honor of their b’nai mitzvah. The mighty duo raised an astounding $60,000 (yes that’s SIXTY THOUSAND DOLLARS!!!!). Guests were clearly moved by the twins’ love for their cousin Charley and their commitment to the cause. To boot, mom and dad bought a slew of Charley’s Fund flat-brim baseball caps and knit caps to give out as party favors, further helping to support our mission and spread the smile.